Sundays and bank holidays: 10:30am – 6:30pm. Closed on 23rd & 25th December and 1st January. The best time to visit is early morning, from 10am, on a non-match day, before the crowds and tour buses arrive! We are comparing Santiago Bernabeu Tour (Real Madrid Stadium Tour) : Priority Entrance Prices from leading ticket suppliers and Try to find you Cheap tickets prices on the market. 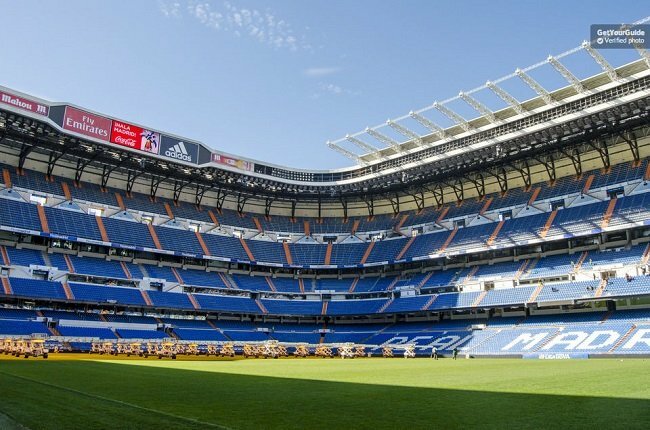 As well as being the home of the world-famous football club Real Madrid, the iconic and prestigious football venue called Bernabeu has hosted 4 European Cup finals, the 2010 Champions' League final, and the 1982 World Cup Final. The stadium which is named after Santiago Bernabéu, one of the teams former coaches, was built in 1947 and has payed witness to many historic moments in football. On your visit you can re-live some of those historical moments and get behind the scenes to access areas that, until recently, were reserved purely for the players and managements eyes only. The 1 and only tour that true Real Madrid fans need to go on whether young or old. A must-do for anyone who loves football and wants to see what goes on behind the scenes. Even non-football fans have reported finding the tour interesting and having a great day out. Your Experience With Santiago Bernabeu Tour (Real Madrid Stadium Tour) : Priority Entrance? On this self-guided, self-paced tour with priority entrance you'll be able to walk in the footsteps of famous Real Madrid players like Ronaldo, Ramos, and Bale as you explore behind the scenes and get access to all areas at Real Madrid FC. Start off the tour with a panoramic view of the stadium – The ideal place to snap some selfies! View Real Madrid's shiny hardware in the trophy room with European Cups, Intercontinental Cups, Spanish League Trophies, Spanish Cups, and UEFA Cups all on display. See inside the players changing rooms. See how the kit has changed over the years and view the kit and boots from some favourite famous players. Tour the presidential box and see the view and the comfort that the VIP's get to experience on Match Day. Walk down the players tunnel and imagine the rush of adrenaline that the players must feel moments before they step on the pitch. Visit the museum rooms; The Best Club in History Room and The Sensations Room to find out more about the history of the club and all the players via the interactive high-tech displays. Watch iconic moments on the big screen and re-live Real Madrid's biggest victories. What Santiago Bernabeu Tour (Real Madrid Stadium Tour) : Priority Entrance Includes? Priority entrance (no need to queue to buy a ticket) to the Madrid Bernabeu Stadium Tour aka Real Madrid FC Stadium Tour. The 'tour' is self-guided, you will make your own way around the stadium/museum, at your own pace, following the signs as you journey from the stand, down onto the pitch and into the dressing rooms. You also have access to the trophy room and are sure to enjoy the high-tech museum as you learn about the clubs history and players via the interactive displays. If planning a visit on a match day, the tour is accessible until 5 hours before kick-off, but with no access to the dressing rooms. The 'Best Club in History Room' and the Trophy Room can be accessed until 2 hours before kick-off so leave those rooms to view last. Free entry for kids under 5. Travelers Reviews about Santiago Bernabeu Tour (Real Madrid Stadium Tour) : Priority Entrance? Visitors talking about this tour on TripAdvisor, Viator, and Getyourguide are more than happy with this tour, it having an overall rating of 5/5. Visitors say that this is the best tour for Real-Madrid fans and that they were impressed with everything they got to see. Words including 'Splendid', 'An Amazing Experience', and 'Truly Access All Areas' sum up travellers experiences on their trip to explore inside Real Madrid's Bernabeu stadium. A few visitors were disappointed, saying that their visit here was not as good as their time on the Barcelona Stadium tour. People who booked through Viator also noted that they needed to exchange their booking voucher for a ticket at the ticket office meaning they needed to queue. The stadium tour is NOT fully wheelchair accessible. Wheelchair users can get access to the trophies room, benches and coaching area only. A wheelchair attendant is on hand if required. E-tickets are accepted on your smartphone or device, as well as traditional printed tickets. Be prepared for security screening. Entrance Details: Enter via Tower B, walk up the stairs and scan your ticket at one of the turnstiles.